The church is chosen by God. But the church did not replace Israel. The church is the fulfillment of the reason God chose Israel as His elect nation. And just as God chose Israel to be a blessing to the world, so also, the church, as the elect people of God, are to be a blessing to the world. Mark Driscoll’s fall has led many to ask questions about the church. This is good! Mark Driscoll was not the problem at Mars Hill. He was a victim of a larger problem in Christianity. 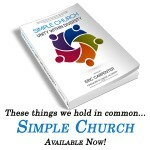 It is possible to have unity within the church only if we give up on uniformity. Unity is a Godly goal; uniformity is not. Do you want Christian unity? Begin by recognizing, encouraging, and celebrating our immense diversity.